After joining forces with the Avengers in "Captain America: Civil War," Peter Parker embarks on a new journey as the titular hero in "Spider-Man: Homecoming." 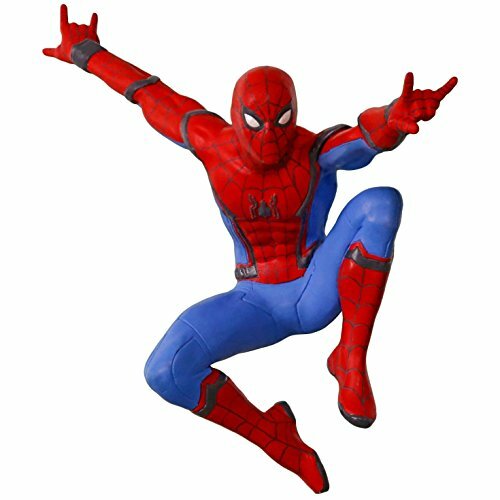 Celebrate a new era of the film franchise with this Christmas ornament that features Spidey in an action-packed, web-slinging pose. Festive and collectible, Hallmark Keepsake Ornaments come ready to give in a seasonal holiday gift box. The box can also be used for ornament storage. This Hallmark Keepsake Ornament measures 4 x 3.7 x 3.2 inches and comes in a 4 x 5 x 3.4 gift box. Ornament is made of plastic. Each piece includes one 2017 Spider-Man: Homecoming A New Kind of Hero Christmas Ornament in a gift-ready box. From preserving precious memories to commemorating special milestones, there's a Keepsake Ornament for everyone on your list. Hallmark has been your family-owned creator of greeting cards, gifts, gift wrap and more for over 100 years. We take deep pride in helping individuals connect in just the right way. This Hallmark original Keepsake Ornament features unparalleled artistry and exceptional detail. The ornament is lead-free and made for years of celebrations. With the guidance of Iron Man, teen Peter Parker begins a new life as Spider-Man. This Christmas tree ornament features the heroic web-slinger in a classic pose. This Hallmark Keepsake Ornament measures 4 x 3.7 x 3.2 inches and comes in a 4 x 5 x 3.4 gift box. Ornament is made of plastic. Each piece includes one 2017 Spider-Man: Homecoming A New Kind of Hero Christmas Ornament in a gift-ready box. Hallmark Keepsake Mini Christmas Ornament 2018 Year Dated, DC Comics Justice League The Flash Miniature, 1.3"